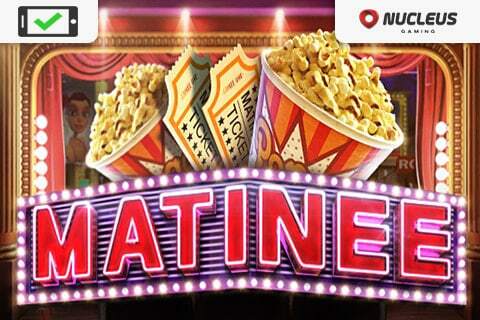 Matinee Slot Review - Play Movie themed Slots Machines FREE! Nucleus Gaming’s block buster, Matinee Slot machine is presented to players in 5 reels and 25 paylines. 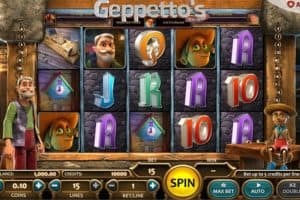 This casino slots game offers a various coin denomination starting at 0.02 and going up till $1.00. The Matinee Slot game gives you the chance to activate the number of paylines you wish setting the maximum bet at 120 meaning you can bet maximum 5 coins per active payline. Depending your wagering amount the regular symbols are paying decent cash prizes. You can also enjoy the auto-play feature and let the game play for you or use the max buttons. Unfortunately, the game doesn’t offer the double-up feature unlike many other Nucleus slots machines. Never has a block-buster hit been such a big deal before the Matinee Slot game. 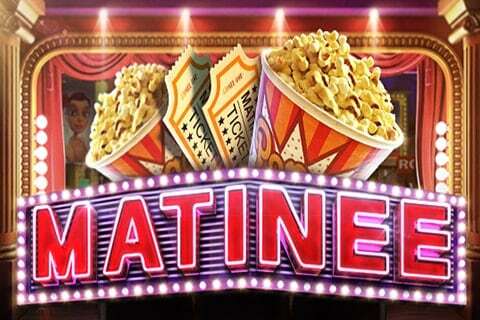 There’s nothing better than a night at the Movies, unless of course you’re winning big cash with Matinee! Grab some popcorn and coke and enjoy your favorite movie inside your own theater. Matinee Slot takes you to an impressive journey in an imaginary cinema with a stage filled by amazing 3D graphics and smooth soundtrack. The Matinee Slot machine is fully packed with original features and a brilliant graphic universe to make to make you love it from the 1st spin. The theme related symbols present on the reels consist of a bag of popcorn, an award, tickets and movie related playing cards. Watch for the drama masks symbols to complete sets and double your winnings as they act like Wild symbols replacing all the regular symbols expect the Scatter. The Projector symbols is the Scatter in the game and helps you trigger the Matinee Slot Free Spins Round. Land Scatter symbols anywhere on the slots reels to activate the Matinee Slot Free Spins Bonus Round. You will be taken to another screen and be rewarded with 8,12 or 20 free spins by landing 3, 4 or 5 Scatters respectively. During this bonus feature all your winning combos will be doubled, and you will have the chance to re-trigger this feature by landing additional Scatter symbols on the reels. 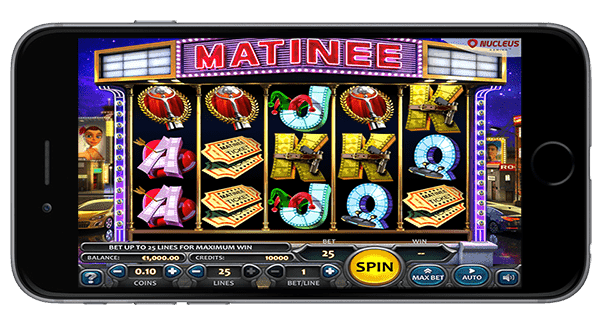 Matinee slot game is a mobile friendly Nucleus casino game available to be played on ipad, android or iphone devices. Everyone loves the movies? 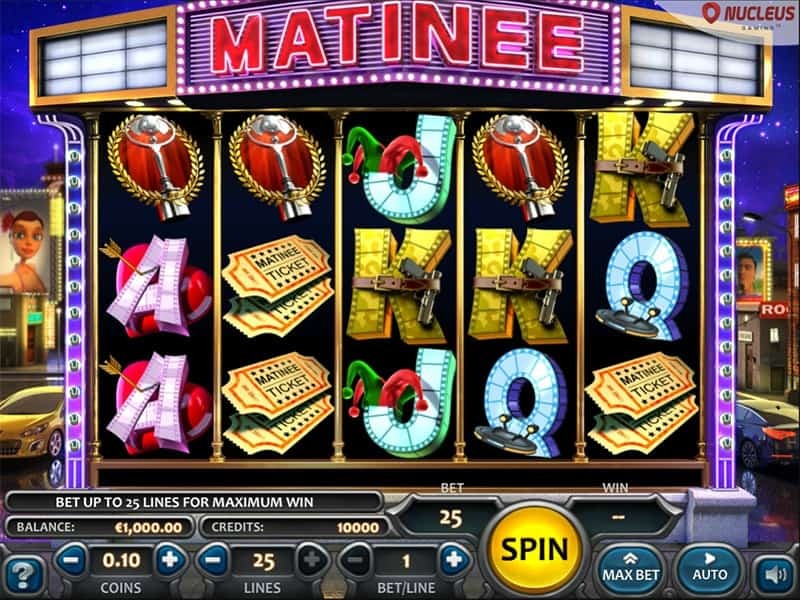 So why not spend a night spinning a movies themed casino game like the Matinee Slot! 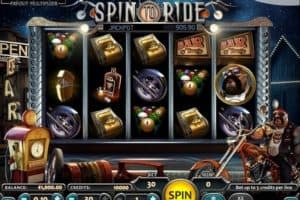 Casinos Online Review recommends you grab some popcorn and settle in for a night playing this entertaining slots game. 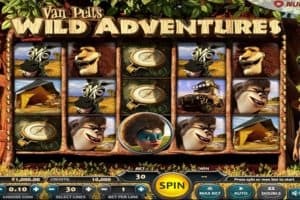 Casino games enthusiasts who like story lined themes and enjoy a little hollywood will enjoy this video slot machine. Play Matinee slot for free in our casino GAMES ROOM or play this movie slots game for real at any of our top Nucleus Casinos below.